Safety Matches is a small, but essential item of life. Origin of matches is China. In India, matches were imported from France & England. Later in 1921, matches were manufactured at Calcutta by machines. By know-how technology from calcutta, 2 persons started the match industry, namely Mr. P. Ayya Nadar and Mr. A. Shunmuga Nadar at Sivakasi in 1922. They prepared to produce matches through the imported machine from Germany. Those were the days, where Freedom Movement and Swadeshi Sprit was catching on, he sold the machine and started handmade matches production. 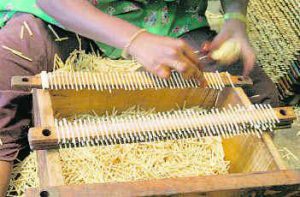 Till now in Sivakasi, matches were produced in the same handmade technology. By which huge number of people in and around Sivakasi get employed. During 1950s, Lucifer Match Industry and Bharat Match Industry, the first unit of South India, were started at Sivakasi by them. The match industries faced a very tough time between 1965 to 1975 as there was a scarcity for raw materials and red phosphorus. So in 1971, the industrialist and the founder of red phosphorus processing units started the red phosphorus units at Sivakasi itself in order to overcome the drawbacks.So in 1971, Mr. R. Shroff, an industrialist and founder of red phosphorus processing units helped to put up a red phosphorus unit to meet the need of cottage industries in and around Sivakasi. These match industries were extended to the neighbourhood <i>Sattur</i> and <i>Kovilpatti</i>later on Mr. Ayya Nadar took sincere efforts to produce raw materials with the help of Government of India. The Pioneer Group of Industries started Potassium chlorate factories on limited concern basis by enlisting shareholders and supplied materials which helped increased production and offered employment to lakhs of people. Match making is ofcourse a cottage industry which employs only adults to took up raw materials and semi finished goods. They are also doing the packaging jobs. In and around Sivakasi, the handmade Small Scale Sectors (‘C’ Unit) are about 280 units, each of which produce more than 75 million sticks per annum and Tiny Sectors (‘D’ Units) are about 3200 units, each of which produce less than 75 million sticks per annum. Among the total production of matches in India, 30% by WIMCO (Machine based manufacturing company), 58% by ‘C’ units and 12% by ‘D’ units. There are more ancillary units which depend on match industries. As an development in this industry, handmade safety matches were exported to foreign countries and yielding more foreign exchange to India. “All India Chamber of Match Industries” is an association which is formed for the welfare of match industries, 135 members have enrolled.